I have a great idea. This fall, let's take Matt Lauer and [insert whichever botoxed beauty is the current co-anchor], and have them call all televised NFL games. Let's tape delay all games so we can eliminate the 3rd quarter altogether--it's probably not that important, after all--and for the remaining quarters, let's replace coverage of every other play with shots of the players on the sidelines and melodramatic fluff pieces of the most popular guys. This would never fly with football fans, yet this is how gymnastics is presented. World-class athletes in one of the most popular Olympic sports are reduced to campy characters on cringe-inducing reality TV. In the past twenty years, we've seen fewer and fewer broadcasts, more uninformed and embarrassingly melodramatic commentary, and massive reduction of the number of routines and gymnasts viewed. 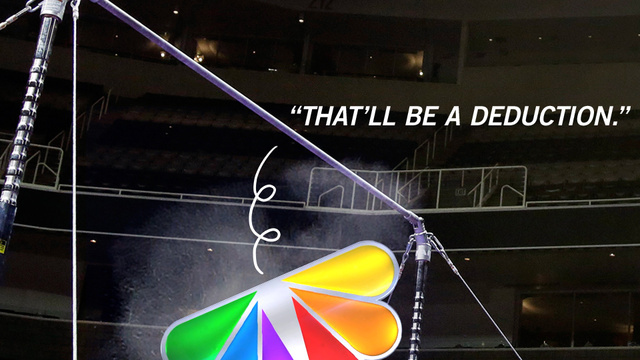 At a time when gymnastics is on the world stage and the general public is clamoring for more, NBC is giving them less and making a mockery of it too. The goal of FIG and USA Gymnastics should be to grow the sport, not make it seem totally inaccessible. NBC coverage, fluff pieces, and commentators are counter-productive to this goal and are an utter embarrassment to the sport. I'm not sure if there's any way for USAG to get us out of a contract with the devil, but they are the governing body of the sport in this country--don't they have any influence AT ALL on how gymnastics is broadcast? Dvora Meyers has been doing a fantastic job of translating gymnastics for the masses, injecting a healthy dose of sarcasm and wit while demonstrating a keen knowledge of the sport. Her pieces are often featured on Deadspin and she's got the best gymnastics blog around, Unorthodox Gymnastics. She's also way funnier than I am and a qualified professional writer, so please take a moment to read the following spot-on article, and forward it to every gymnastics enthusiast you know. Who knows, maybe we'll spark some change.